Because I mainly write articles and reviews for a living, I tend to do most of my work down at the coffee shop. So as a result, my iPad is pretty much my go to device. Although I do use my iPhone quite often for news/weather/communications. And actually, the rundown of power can catch me unawares. Anyone who’s patronized a coffee shop in the last five years knows of the fierce competition involved in vying for a position near a wall outlet. That’s why I purchased Zagg’s Sparq. Let the plebes jockey for a space. I have work to do. If you can plug in an Airportt Express, congratulations! You have conquered the learning curve for the ZAGGsparq. That’s all there is to it. There is a row of Blue LEDs that line the top of the charger to let you know that the charger is charging. There are two USB 2.0 ports on the side of the 6000, which practically all USBs (unless it’s something proprietary). 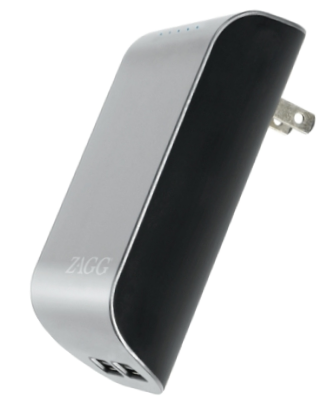 As you’re charging your ZAGGsparq, plug in your iPhone, Touch and/or iPad to juice them up as you charge the ZAGGsparq. I think that it’s safe to say that it’s more difficult to operate a sneaker. It’s solidly constructed and feels like it could easily withstand traveling in back packs. I find it disconcerting that the row of blue LEDs go out about ten seconds after you remove the charger from the outlet, plug in your device, turn it on and begin charging. With the LEDs off, you have no way of knowing if your actually charging your mobile device or have it plugged into a dead charger. It doesn’t affect the rapid charge, luckily. It’s quite fast. It’s nothing that ZAGG can do. It’s just the nature of the beast. The 6000 is one more piece of kit to carry about. Then again, I can think of several times that this would have saved my bacon … Errr, file. This is a nice, compact tool that I will most definitely make room for in my travel kit. And if they’d fix the LED situation during charging, ZAGGsparq would be a 10 out of 10. Irregardless, I’d still recommend this to friends. Particularly if they’d like to buy me a spare. This entry was posted on Tuesday, January 22nd, 2013 at 5:40 am	and tagged with hardware, iPad, iPhone, reviews, YMPNow and posted in Reviews. You can follow any responses to this entry through the RSS 2.0 feed.